In July 2004, EISA opened an office in Maputo, Mozambique to assist the electoral stakeholders in Mozambique. The project was developed against the background of the election disputes of the 1992 and 1999 general elections in the country. As result the project activities focused on election-related conflict management. The project activities included, inter alia, the training of representatives of the National Electoral Commission (CNE) and its secretariat (STAE), civil society organisations and political parties on democracy, elections and conflict, the facilitation of discussions with similar stakeholders around conflict management mechanism and assisting CSOs in monitoring the process. Training at both national and provincial level was successfully concluded. In addition to this EISA Mozambique was also involved with the dissemination of the Principles for Election Management, Monitoring and Observation (PEMMO) in Mozambique, the promotion of fairness of the electoral process, the mnonitoring the use of public resources during elections, the production of handbooks on electoral legislation, in English and Poruguese and an Observer's Guide (see Publications) and the deployment 34 observers in an Electoral Observer Mission to the 2004 elections (see Mozambique: Parliamentary and Presidential 1-2 December 2004 [PDF]). After the successes attained in 2004, a new programme was adopted in 2005 titled 'Consolidating Democracy through Enhancing the Capacity of and Partnerships between Key Stakeholders in Mozambique'. The programme began with two main objectives: (i) to support electoral reform initiatives, and (ii) to enhance the partnership between civil society and Parliament in order to strengthen a culture of accountability of elected bodies. A third component was added - to promote knowledge and debate on elections, governance and democracy through the establishment of a documentation centre. The programme was implemented through partnerships with, and technical assistance to, local institutions in civil society and academia and the promotion of dialogue between civil society and elected bodies. By the end of 2005, in a polarised society, EISA had position itself successfully as the honest broker capable of advancing democracy in Mozambique despite the tension and distrust between the country's two main political parties. The first of three main objectives for EISA Mozambique adopted in 2005, support for electoral reform initiations, was largely attained. Work on the second, to enhance the partnership between civil society and Parliament, made little progress. However the creation of a documentation centre, the final main objective, advanced to the point where the Centre could be opened in 2007. From that point onwards it would be developed further beyond a repository of documentation into a promoter of open debate and creator of new knowledge. To facilitate this process a librarian was hired. With substantial progress having been made on two of the three objectives of EISA Mozambique's work, its scope of activities was broadened to include support to civil society organisations in the selection of their representatives in the new Election Management Body (EMB) and the provision of capacity-building support to the new EMB. The EISA Mozambique collaborated with the Johannesburg office on the implementation of a pilot regional programme on civil society participation in the African Peer Review Mechanism (APRM) process in Mozambique, with funding provided by Swiss Agency for Development and Co-operation (SDC) - Pretoria. All programme components were implemented, with the exception of the Civil Society-Parliament Partnership activity, which has suffered constant delays as a result of lack of response on the part of the identified implementing partner. Funding for these activities in 2007 was provided by DFID and Irish Aid. EISA, in collaboration with the Electoral Observatory, a coalition of eight Mozambican civil society organisations, condcted a pilot voter register testing in 33 municipalities, ahead of the November 2008 municipal elections. In conformance with a 2007 agreement, EISA translated into Portuguese the 10 election-related modules of BRIDGE and submitted to the Electoral Commission several training schedule proposals. EISA provided, on a continuous manner, analysis and advice on electoral matters to the EMBs, the donor community and the general public. In 2008 the Documentation Centre, launched in 2007, continued to expand the available documentation. EISA signed a Memorandum of Understanding with the Mozambican Association for the Development of Democracy and contacts were made with a wide range of CSOs and with Parliamentary committees; five joint roundtables between civil society organisations and parliamentary committees took place. In collaboration with the Mozambican Institute for Socio-Economic Studies (IESE) and the Comparative National Elections Project (CNEP), EISA organised a series of three public debates on electoral participation/abstention with a focus on Mozambique. In October, EISA Mozambique hosted in Maputo the 3rd Annual Symposium, the first outside South Africa. Finally, the transparency and credibility of the municipal elections was enhanced through conducting voter register testing in 33 municipalities as well as the PVT conducted in 13 municipalities. The EISA programme in Mozambique in 2009 was dominated by the electoral process that led to the presidential, legislative and provincial elections held on 28 October 28 2009. Therefore, most activities implemented throughout the year - training, technical assistance, debates, and media events - were related to that process. This was also the year in which the programme, being implemented since 2005, came to an end, after a 12-month extension at the end of 2008. During its two last years, the programme was exclusively funded by the UK's DFID in Mozambique. The main activity undertaken by the Mozambique office during 2010 was its contribution to the EISA Africa Democracy Strengthening project, providing support for electoral reform, and to the institutional capacity of political parties. As far as electoral reform is concerned, the Mozambique office contributes to and supports electoral reform efforts led by the Mozambican Parliament, which is aimed at revising the current electoral legislation in Mozambique as a result of shortcomings identified during the 2009 electoral process. The Mozambique office worked with the three Mozambican parliamentary parties, namely FRELIMO, RENAMO and MDM, to provide institutional capacity building assistance through training, technical assistance, and exchanges with other sister parties. The Mozambique office also facilitated the contribution and participation of Mozambican institutions in the process of developing continental benchmarks for democratic political parties. In 2011, the EISA Mozambique Office provided support to the electoral reform process in Mozambique and supported the development of the institutional capacity of political parties. EISA contributed to the electoral reform efforts which was led by the Mozambican Parliament and aimed at revising the current electoral legislation in Mozambique arising from the shortcomings identified during the 2009 electoral process. EISA worked with three Mozambican parliamentary parties, namely FRELIMO, RENAMO and the Movimento Democrático de Moçambique (MDM), where EISA provided institutional capacity building assistance through training and technical assistance. The Mozambique Office also contributed to general EISA activities including the APRM programme and the process of developing continental benchmarks for democratic political parties, as well as participating in EISA's continental observer missions. In 2012, the EISA-Mozambique Office: (I) Supported Electoral Reform and (II) Supported the Institutional Capacity of Political Parties. Under component I, the Mozambique Office supported electoral reform efforts, led by the Mozambican Parliament, which aimed to revise the electoral legislation in Mozambique, based on shortcomings identified during the 2009 electoral process. Under component II, the Mozambique Office worked with the three Mozambican parliamentary parties: FRELIMO, RENAMO and MDM (Democratic Mozambican Movement), to provide institutional capacity and building assistance through funding, training and technical support. With the support of the British Embassy, the EISA office also began a small research action group to look into the situation of women in positions of leadership in light of the 2008 SADC Protocol on Gender and Development. The EISA-Mozambique Office also contributed actively to the achievement of headquarters based outcomes, such as support to SADC election work. The programme was implemented in an intense political environment as political parties were preparing for local elections at the end of 2013 which were a prelude to the 2014 general elections. In 2012, two of the main political parties with seats in Parliament held their national Congresses, and the dispute between the ruling FRELIMO party and the main opposition party, RENAMO, over the state of democracy in Mozambique reached a peak with threats by RENAMO to make the country ungovernable. EISA's work in Mozambique was largely supported by the Department for International Aid (DFID), The Royal Danish Embassy (Danida), the Swedish International Development Cooperation Agency (SIDA) and the Swiss Agency for Development and Cooperation (SDC). In the period October to December 2013, EISA Mozambique implemented the last phase of the Africa Democracy Strengthening (Phase II) Programme. Since the start of the programme, there was "Increased Transparency of the 2013/2014 Electoral Process in Mozambique (ITEP)". Under the ADS II, EISA Mozambique Office provided support to the electoral process through its participation in the selection process of the new National Electoral Commission, training citizen observers and journalists on observation of voter registration and coverage of electoral process as well as support to strengthening the institutional capacity of the Mozambican political parties, Front for Liberation of Mozambique (FRELIMO), Mozambique Resistance Movement (RENAMO) and Democratic Movement of Mozambique (MDM). Under the ITEP programme, EISA Mozambique focused its activities on strengthening the capacity of political parties to monitor the municipal elections of 20 November. As part of this focus, EISA, supported citizen observation of local elections process and provided public information about the elections. Further than that, EISA Mozambique trained FRELIMO and MDM party agents; providing technical support and teaching for parallel vote tabulation conducted by the Electoral Observatory. EISA moreover followed and reported on all stages of the local elections process, and deployed a Technical Observer Mission. A dedicated website and Facebook page focused on the Mozambican 2013/2014 electoral process to provide the public with documentation, data and news about the elections was also setup by the EISA Mozambique office. The ITEP project continued in the Mozambique office jointly funded by the DFID, Danish International Development Agency (DANIDA) and SIDA. EISA-Mozambique also continued the implementation of activities to promote the increased presence of women as candidates for parliament in the 15 October 2014 general elections. The office further provided support to activities managed by the EISA Head Office, especially support to EISA EOMs, AUEOMs, and APRM-related activities, by means of residual funding from the British High Commission. The above activities were undertaken against the backdrop of political and low-intensity military conflict between the FRELIMO government and the main opposition party, RENAMO, with localized violence in central Mozambique since late 2012. Both RENAMO and FRELIMO were engaged in stretched negotiations in Maputo around four points submitted by RENAMO (a) Change in the electoral law (b) Security sector reform (c) "De-Frelimisation" of the civil service (d) Better redistribution of national wealth. Various changes followed the negotiations: A settlement on the electoral law leading to substantial amendments to electoral legislation by parliament, a security agreement in July and ultimately, a cessation-of-hostilities accord on 5 September allowing RENAMO to participate in the electoral process. Under the new electoral legislation, political parties were entitled to have two party agents: Effective and Alternate, with one polling station official at every polling station. Given that there were around 17,000 polling stations, this meant that each political party had to recruit, train and deploy a total of 34,000 party agents and 17,000 polling staff. During 2015 EISA's Mozambique office began the implementation of a 12-month extension of the 'Increasing Transparency of the 2013/2014 Electoral Process in Mozambique' Project, focusing on post-election reforms. The extension was funded by the Department for International Development (DFID). At the same time, the Mozambique office also initiated the implementation of the Mozambique specific Africa Democracy Strengthening Programme's activities, funded by the Swedish International Development Agency (SIDA), aimed at electoral reform, support to political parties and capacity-building for elected officials. The implementation of EISA Mozambique programmes took place against the backdrop of continued political and low-intensity military conflict between the government of Mozambique and the main opposition party, RENAMO. The protracted negotiations that had begun in 2013 and resulted in a cessation of hostilities agreement in September 2014, as well as substantial changes to the electoral legislation, continued after the 2014 elections, the results of which were rejected by RENAMO. The object of the negotiations was to address outstanding issues of security sector reform, the 'de-Frelimoisation' of the civil service and better redistribution of national wealth. However, the negotiations broke down in 2015. Subsequently, the RENAMO leader's convoy was twice attacked by government forces during his travels in central Mozambique and Dhlakama went into hiding in his stronghold in the Gorongosa district. Neither the political nor the economic problems that it and other exogeneous forces engendered have had a significant impact on the implementation of EISA Mozambique programmes. 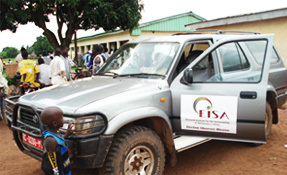 The Carter Centre and EISA, worked had in hand with the DFID in electoral reform projects. This project was funded based on unused funds in the DFID's reserves. Given the recent general elections in which FRELIMO won the presidential and legislative seats, this no-cost extension of the ITEP programme was essential. Other reform activities focused on developing legislative reform proposals on key issues and components of the electoral process in Mozambique. For the EISA Mozambique office 2016 was a transition year. The 'Increasing Transparency of the 2013/2014 Electoral Process in Mozambique' project ended on 31 December 2015, after a one-year extension. In the following 12 months the office focused on modest activities as part of the Swedish International Development Cooperation Agency (SIDA) 'Africa Democracy Strengthening' programme, while a new programme was designed and funding sought. In October 2016 a programme agreement was signed with SIDA Mozambique for a 43-month programme titled 'Stronger Stakeholder Capacity for the 2018/2019 Electoral Process in Mozambique'. The aim of the programme was to create a more credible electoral process by involving electoral stakeholders, to be achieved by encouraging political parties to play an effective role in governance and election monitoring, improved management of the elections and stronger civic engagement in the electoral process. The primary method of achieving these aims would through be capacity-development activities such as training, mentoring and technical assistance. The primary beneficiaries of the programme would be the three main political parties, the election management body and Mozambican civil society organisations involved in election observation. As EISA acknowledges the key role of women in governance and recognises the challenges women face in exercising full participation rights in patriarchal societies, where gender relations are skewed in favour of male dominance in the spheres of leadership, decision-making and agenda-setting, the programme was to pay particular attention to promoting gender equity. In 2016 the Mozambique office focused its activities on post-election reform, training of elected officials and support for party caucuses in Parliament. In this period the Mozambique office also established the foundations of the new programme and provided support for other EISA departments, including technical support for the African Union election observation missions, among other activities. The political and economic environment in which EISA worked in 2016 was dominated by two crises. One was the political-military crisis caused by the conflict between the government and the main opposition party, RENAMO, following the 2014 elections, the other the economic and financial crisis caused by a decline in commodity prices in international markets, investors holding off on investments due to the political situation, scarce foreign currency reserves and drought in southern Mozambique. However, neither the political nor the economic problems has had a significant impact on the implementation of EISA's activities, apart from the work undertaken iro Electoral reform. EISA Mozambique focused its work on the 43-month programme titled "Stronger Stakeholder Capacity for the 2018/2019 Electoral Process in Mozambique" that commenced in October 2016. The intended impact of this programme was a more credible 2018/2019 electoral process, through improved engagement of electoral stakeholders in the process, in particular working with political parties in governance and election monitoring, an improved management of the elections, and stronger civic engagement in the electoral process. These outcomes would be accomplished primarily through capacity development activities, such as training, mentoring, and technical assistance. In late 2016 and early 2017 Memoranda of Understanding were signed with the National Elections Commission, the three parliamentary political parties (FRELIMO, RENAMO AND MDC) and , and the newly-created, EISA initiated, "Platform for Election Observation", to establish the parameters and conditions for cooperation between EISA and these institutions for the lifetime of the programme. During 2017 EISA Mozambique also worked with partners to develop individual annual work-plans, which informed the programme's global annual work-plan for the year. The CNE requested EISA to begin its support in 2017, rather than 2018, as initially planned, as it would respond better to CNE's planning and activity implementation cycle. In addition to its focus on this programme, the EISA Mozambique office provided support to other EISA departments, including technical support to the African Union Election Observation Missions, among other activities. The political and economic context of Mozambique during 2017 in which the programme was conducted, was dominated by negotiations between the Government and the main opposition party, RENAMO, to put an end to political-military crisis caused by RENAMO's rejection of the 2014 elections. This year was characterised by a serious economic and financial crisis, due to the accumulated debts incurred by the Mozambican state, suspension of direct budget support by international partners, decline of commodity prices in international markets, investors holding off on investments due to the political situation, and scarce foreign currency reserves.